Medium: day glow spray paint, rustoleum, poster paint, magic marker, and cutout poster board, on poster board, oil paint. Done: Frostburg, MD September 2004. Note: I designed this logo for myself when I was in Western Junior High School (middle school), if I remember aright. Later I learned that the Hopi Prophecies state that one of the helpers of the True White Brother will use the Sun as a logo. 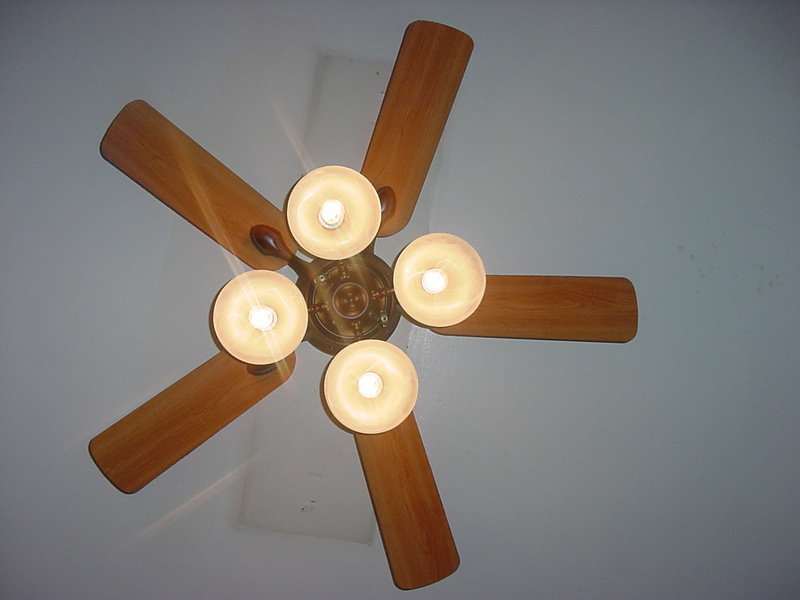 Title: Joe's Fan 1 [216 kb] This is the beginnin stage of the work, an untouched photograph. As you can see, it is not quite radially symmetrical. I want to edit it so that the quatripartite element will be radially symmetrical. And the center is dark. No no no. 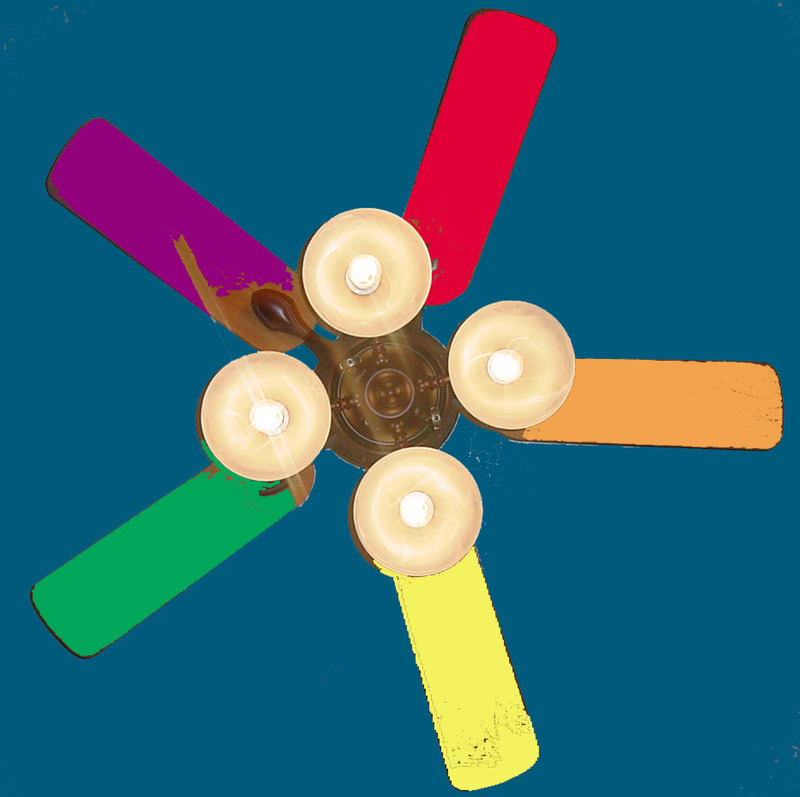 Title: Joe's Fan 2 [259 kb] Here my friend, Frank V., began colorin the mandala, but he gave up. Done: USA. Note: This picture was scanned in two parts. The original does not have the vertical joint line that the computer image has. Note: I want to deepen some of the lines in this one, and to generally improven the quality. Medium: Ball point pen on place mat. Note: This picture was scanned in two parts. The original does not have the vertical joint line that the computer image has. Prints will not have this joint, either. Medium: Ball point pen on dinner napkin. Medium: Cutouts, rubber cement and/or scottish tape on poster paper. Done: USA, Frostburg, MD, and/or Fort Ashby WV. Late '90's or early 2000's . Note: The girl and the dog in the upper left should have been lookin to the right and slightly upward, to keep the clockwise centripetal motion rule that I follow. After I had done a lot in their quarter of the collage, I noticed that their eyne were directed more downward. I tried to correct this impression by puttin jewels into their eyes. It didn't work as well as I wanted it to do. Note: There is a tradition that spiders should be risin. The ones in this collage are supposed to be fallin. That may be bad. It may even be bad to have spiders in it at all. I have seen sources claimin both extremes of good and bad for spider symbolism. I think it depends too much on the context and the internal context possessed by the viewer themselves, and, so, the meanin would be to variable from person to person, and therefore they, maybe, should be excluded from mandalas intended to be beneficial. But still I don't know yet. There is a few other thins I don't like about this mandala. The green caterpillar is in the lower right corner because it is a toy. However, it is also a bug, and that's bad. I used to put in anythin that was a toy. Since I started, the toys have become more and more hideous with the passage of time. So I put in only toys made in the images of thins which themselves have positive symbolism. The hands drawin each other give the impression of anti-clockwise movement, which is unhealthy. The models used to represent a mother and daughter appear posed, as if they didn't know each other before the shootin session, and have no feelin for each other. The dog in the upper left does not give the feelin of movin to the right because of facin toward the camera, and his upper body is toward the camera. The bed in the lower left seems to be movin down and right instead of up and left, as I intended it to seem. The little dog in the lower right is facin the wron way, although his head gives movement in the correct direction. This is one of the mandalas I tried to produce in a batch, tryin to cut down production time, with the intention of sellin them, and keepin the hourly income up. Eventually my inner voice (as it were) said not to bother sellin them. I gave a few good ones away. One I traded for a paintin of a cat, done by an FSU grad from Bosnia. Maybe I'll remember her name and put it into here. One I gave away had several elements from a girl's childhood, such as the indentical breed of dog from her childhood, the same kind of fence around a house (?) and totallin about 5 specific elements. Somethin had guided me to make this one "just for her" although I didn't do it intentionally, and I knew nothin about her childhood. This one was given to Shannon Ottaviani. I gave a very simple one to Rob and Kim Marker, formerly of Frostburg MD. This one was the first in the series. The second one, which was also very simple, was destroyed by the glass and frame breakin while it was bein moved by an employee of a restaurant, where it was on display. I have quite a few more, but haven't taken snapshots of them as with these 3. Unfortunately, most of these were from the batch I tried hurriedly to do. 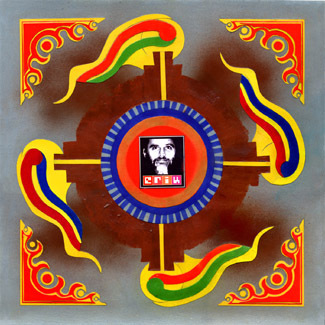 On the whole, though, I think this is still a beneficial mandala. My inner voice says, in effect, "very much so". I don't think the unconscious recognizes the lack of warmth between the mother and daughter. Generally the movement is clockwise, the smaller elements that are out of synch get swept alon by the larger mass. Jacob volunteered to draw some mandalas. He attempted one, but it was not acceptable from the standards of Jung's research. It expressed more the moral dilemma and indecision that Jacob was facin, rather than a perfectly balanced personality. Jacob is presently workin on a mandala that is designed accordin to Jung standards. Look for it in the future! Medium: Pen on drawin paper. 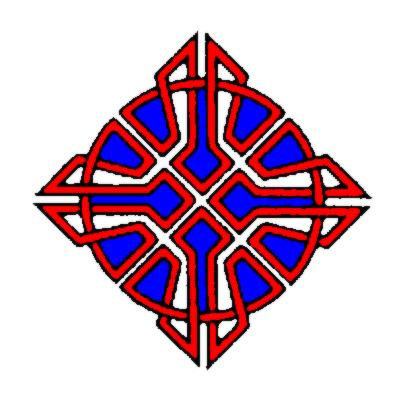 Note: This is an example of a mandala that does not symbolize a balanced personality. Obviously the artist is very talented. He has a style of his own -- I have seen the tattoos that he designed for him self in the same style as this mandala. The problem is that he feels uncomfortable expressin an ideal, he would rather express, in his art, the way that he feels. I interviewed him, and found that the drawin symbolizes well his inclination to revert emotionally to a more comfortable period in his life's time, while desirin to go forward and confront the present. This can be seen by the varyin direction of the motions in the drawin, some elements comin in "head to head" contact with each other, blockin each other's way. The central figure has limbs goin in opposite directions too. I am very grateful to Jacob for makin this attempt, and if you buy the drawin, I'll give the money to him, minus a fee for my time. Mandala Provisional Title: Yin Yang Spiral [200 kb] -- I was holdin the wron side of the mandala toward the camera. I wanted the spiral to uncoil in a clockwise direction, that is the "healthy" direction. So I flipped the image in the editor. Also I had to touch up a white spot that was presumably caused by glare. Kim is a beautiful angel lady who makes stained glass. "I saw my mandalas without knowin what they were, and started paintin them. I see them sometimes, sometimes I convey on them what I feel good or bad. But I love them, I express my feelins through them. The mandalas are from the soul. "Whenever I create MY ART, I use an intuitive, meditative process to brin messages and symbols of healin power. These messages and symbols hold the energies of my intention through color, forms and harmony to myself. 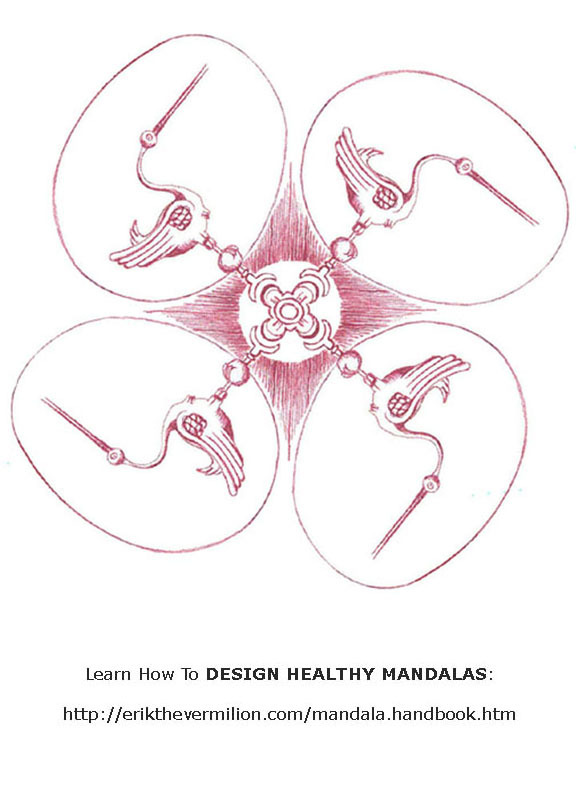 The word "Mandala" means a sacred circle that symbolizes healin and wholeness. Mandala art refers to symbols that are drawn, sketched, or painted in a circular frame. "One of the most important thins about the mandalas is that they have neither a beginnin nor an end. but society is responsible for dissolvin that invisible and powerful connection-the link that keeps our spirit, mind and soul together. "My name is Monica Saul, I was born in Argentina and I moved to Miami 12 years ago. I have been paintin for 15 years now. Art for me has always been a very personal spiritual journey. "It helps me focus my attention away from external worries and concerns, and toward my center and my essence. This process is usually quite relaxin, refreshin and energizin." -- Monica Saul. Many of your pictures have female symbols, and have bilateral (2-part) symmetry, so I think you are expressin a lot about relationships. #2 and bilateral symmetry has to do with relationships between two people, or between a person and one other thin or one other idea. If you do any more mandalas with light colored centers and four parts, or multiples of four, please let me know right away. Or if there is a gem, happy baby, Jesus, flower, star, planet, Sun, or circle in the center, with four parts.